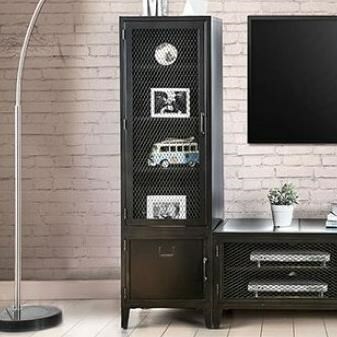 Diverge from traditional wood construction and humor your industrial side with this sleek entertainment set. The full metal frame offers unique functionality with mesh paneled doors that cleverly hide items in a hazy tight-knit grid. Display entertainment devices on lower shelves and easily store items with plenty of shelves for movies, games and controllers. With pointed tapered legs, the entertainment set provides the perfect view for endless binge watching and extended game play. The Clonakitty Industrial Left Pier Cabinet with Wire Mesh Door by Furniture of America at Rooms for Less in the Columbus, Reynoldsburg, Upper Arlington, Westerville Ohio area. Product availability may vary. Contact us for the most current availability on this product. Browse other items in the Clonakitty collection from Rooms for Less in the Columbus, Reynoldsburg, Upper Arlington, Westerville Ohio area.